But after an initial review of the site and having a look around, the folks at Dealspotr were on to something totally different than many of the other coupon / deal sites out there. Check-out the product / service website to see if they offer any coupons there (OR a discount for signing up for their emails). Then I’ll have a look at their social media channels. Sometimes they’ll post a coupon code via their Twitter or Facebook pages. While at the site, I’ll enable my Honey extension to see if they’ve spotted any deals. Lastly, I will check some deal sites to see what they have to offer. Often I’m a little disappointed at the findings because many codes are expired or aren’t any good. This is a little bit of a drawn-out process and I’ve always wished there was a way to skip some of these steps OR make the process of finding the best, valid coupons out there easier. 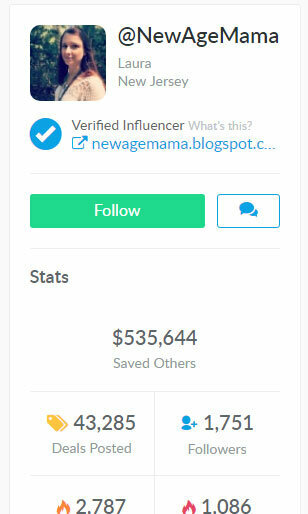 The top influencer in the network has saved Dealspotr customers over $500,000! Curation is one of the keys (I think) to running a useful deal site. There are just so many stores out there – it would be almost impossible to track, find and validate all of the best deals. This is one of the areas that I think Dealspotr has got cornered. They utilize the expertise of its community and “influencers” (as they’re called) to find and post the best deals out there. So, a lot of these deals are posted by some of the best mommy (and I use that term with all due respect) and deal bloggers out there. Not only are some of the best coupon hunters posting deals at Dealspotr, but every deal posted needs some form of verification the deal is legit. This is another notch in the site’s belt. It’s frustrating to click on a deal, get directed to try and redeem that coupon code – only to find out it doesn’t work. If a deal can’t be backed up with proof – it doesn’t go live (saving customers’ valuable time). This creates significant trust in the site. 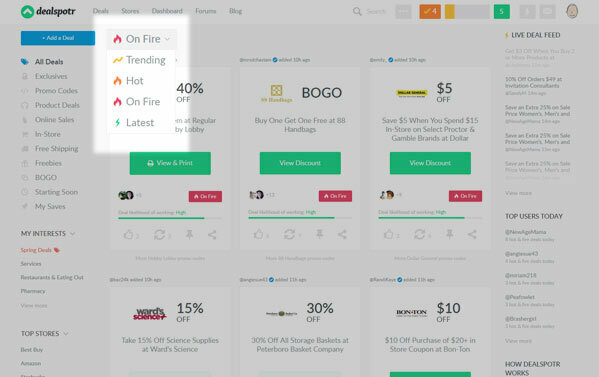 On the DEALS page, users can access all sorts of cool “real-time” information about the latest, trending, hot or on fire deals are out there. I love this feature. While you can search by the store of your choice (or category), you can also see what’s out there for freebies, BOGO, free shipping and in-store offerings. This ability to see what it is out there gives users an excellent overview of offers they could be missing. If you love to look for coupons, why not get rewarded for it? 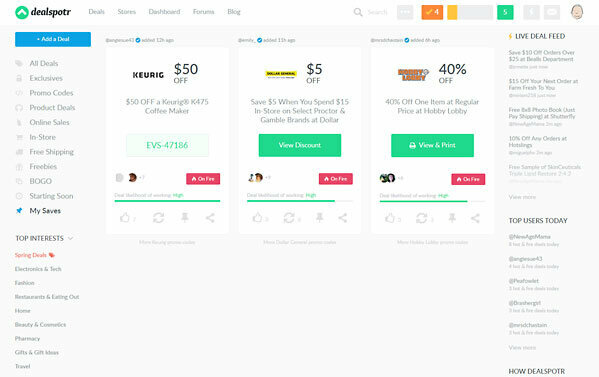 Dealspotr gives away points and Amazon gift cards (Influencers can eventually get cash via Paypal) which can used at your favorite stores for curating (and editing deals) that become useful to others. This is a win-win for all. Dealspotr just launched the new personal feed, where your curated interests, along with people you follow are all combined to give you your own hyper-personalized feed of deals and deal-sharers. It’s on the new homepage. Also, when you are searching through some of the eclectic feeds of trending deals, you can hit the SAVE icon (thumbtack) and it will be posted under your MY SAVES dashboard for later. Another useful aspect of using the site. There are other places to go and seek out online coupon codes and coupons – but I think Dealspotr will be one you’ll end up putting at the top of your list because it will end up saving you time AND money. Join Dealspotr and earn 5,000 points! To get your 5,000 points at Dealspotr, you’ll need to complete the new user checklist and post a valid deal. The fine folks at Dealspotr have sponsored this post and may earn a small commission if you sign up to their site – at no cost to you. All opinions expressed are our own. We are actual “influencers” at the site and have used it to post deals.